Adjustable Height Walking Trolley With Castors. If you think you are looking at the description for a straightforward trolley walker, nothing clever about it? Think again! This trolley is made from plastic coated steel tubing, which makes it a sturdy, robust and reassuring walking aid without being heavy. Four swivel wheels make for easy navigation but what's of real note is the two teak laminated shelves that are clipped to the frame. Easy to clean, and with raised edges to help stop items from slipping or rolling off - and the bottom one is shaped to provide more leg room when sitting. The trolley walker is of course, height adjustable, and its angled handles will provide support when the user needs it. It really is a convenient and safe way for those that require walking aids to transport items between rooms at home. 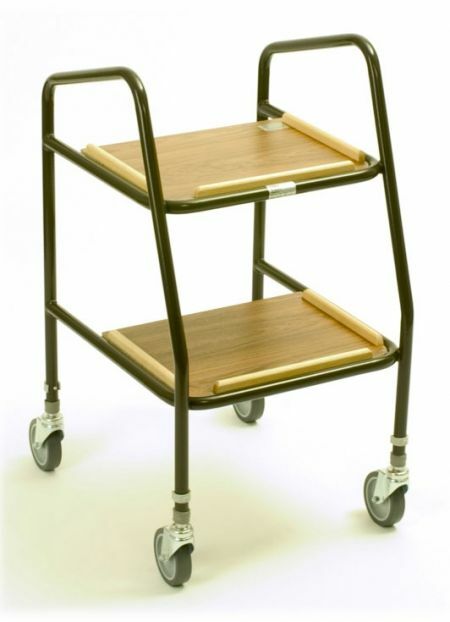 This trolley is ideal for me, I used a walking frame at home but I always struggled to get a cup of tea to my lounge. Now after buying this trolley I am able to get a cup of tea safely to my lounge and this also serves as an ideal indoor walking aid. easy to order from. excellent goods. Excellent quality, purchased for a 95 year old aunty who lacks confidence on her feet. Now finding it easy to get around her home using this trolly.